While surfing around blogs back in September, I came across this interesting post by FongPC titled Are you Generation X or Y? That was an interesting post as it shows the change in mentality of folks of different ages. For those who care to know, I'm firmly planted in the Generation X category. Kinda the sandwiched-in-the-middle generation, if you asked me! Basically what was interesting for me was how this study changes the way I look at things. It used to be that we think people think a certain way because of their age. And when we too reach that certain age, we'll too would think like that as well. Well, the study says we won't. How we think is not just dependent on our age but on what we experience in our lives. Gen-Xers ('65 - '80) went through events like the fall of the Berlin wall (and subsequent thawing of the cold war); Contra war and Iran vs Iraq; the dot-com boom; AIDS; MTV; Reagan, Gates and Madonna -- and in a way, these events and people shape our generation. Gen-Xers were the 'me' generation who learned to rely on ourselves. We were the original latch-key kids who grew up being independent, resourceful but at the same time skeptical and even aggressive. In contrast, the Gen-Y ('81 - '95) youngsters grew up with 9-11 and two Gulf wars; the dot-com bust (dot bomb); cellphone, IM and all things digital; Clinton, Osama and Buffy. 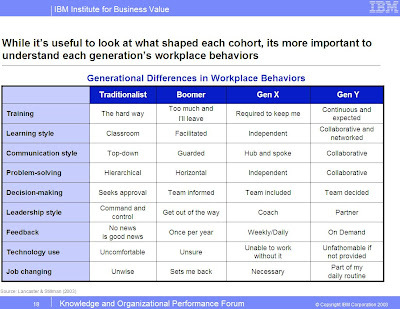 Gen-Y have started entering the workforce, and if you ask the older guys, they get uneasy around Gen-Y 'kids'. The study tells us why we feel like that. Gen-Y are smart, very tech-savvy; multi-tasking and multi-networking (i.e connecting with people). They thrive on learning and excitement and is not afraid of authority (Don't command me, collaborate instead!). Most of all, Gen-Y is the instant-everything generation. They demand instant feedback, expect instant results, have no problem seeing themselves as tomorrow's leaders. Nothing is fast enough for these folks, yet, value work-life balance. Granted, these studies have a decidedly US slant to it, but you have to admit that wherever you may be, you should be able to identify with those traits associated with 'your' generation. Chances are most of you reading this right now are either an X, or Y. Perhaps some Zs too? And hello there if you're a Baby Boomer, glad to see you here! Interested to learn more? Check out a good presentation and even download it here. you view about life is different. i like ur article which is extream about the research u has had made. wow! this is so cool and so true!!!! Yeah Angeline, I guess it helps us understand people better! ... but at the same time I have to also remind myself to resist the temptation to stereotype people just based on their age.... tricky huh!! hi, thanks for mentioning my post! More interesting stuffs here. I think it's true that how we think is not just dependent on our age but also by what we experience in our lives. Yeah, for me, as a Malaysian, one key influence was the whole roller-coaster ride during the Mahathir-Era... our country's finest (yet) and scariest moments all rolled into the twenty plus years...!